It’s about community. Looking out for one another. Making sure your elderly neighbor can get to the doctor. Assisting the family down the block that has fallen on hard times. Helping children go to summer camp. It’s what we do for one another that makes us a community – and it’s about our shared values, too. Providing a vibrant Jewish life for our children. Enjoying Jewish arts and culture. Strengthening our connection to Israel. Federation, along with our beneficiary agencies, is there to help a distressed family regain their footing. To care for our elderly. To help communities devastated by a disaster. Federation holds out a safety net. And we’ll never let it fall. One of the basic tenets of Judaism is that the elderly deserve deference and respect. 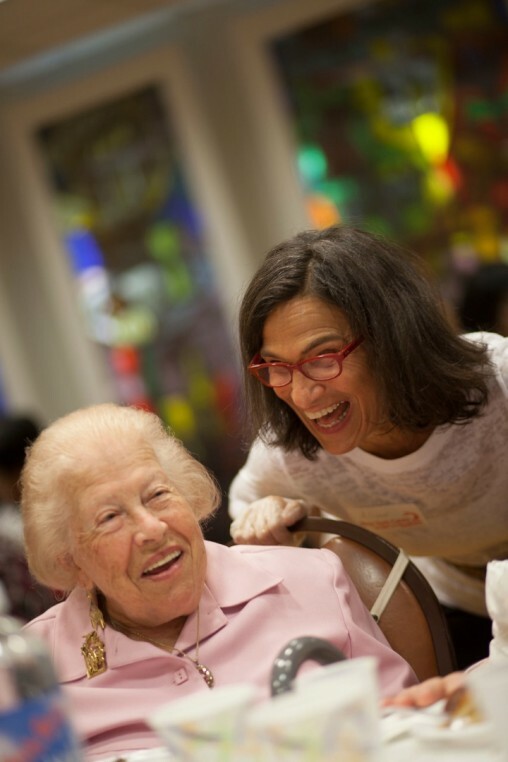 With your help we provide funds to a continuum of services to the elderly, providing Jews over the age of 65 with social activities, healthcare, transportation to and from the doctor's office, housing, food and counseling. Adult Day Care for a safe, supportive environment where seniors enjoy social activities with their peers during the day. Transportation services that offer rides to doctor's appointments, social programming and the grocery store. Kosher meals-on-wheels for nutritious food to those in need. By Hand and Heart craft workshop, seniors contribute by creating beautiful Jewish handicrafts that are sold throughout the community. Special funding has established a Naturally Occurring Retirement Community (NORC), an initiative designed to allow seniors to remain independent at home. The services provided by the Jewish Federation of Greater St. Paul and our agencies for youth and children are as varied as the children themselves, from camp scholarships to child care for low-income families to programs for children with special needs. One quarter of St. Paul's Jewish population is under the age of 17. Some families cannot afford the cost of Jewish programs. Scholarships for Jewish overnight camps, educational trips to Israel, higher education and childcare reinforce Jewish identity, give children hope and a better future. Through special programs for children with physical and developmental disabilities, individuals learn life long leisure skills, develop friendships with peers without disabilities and gain self-confidence, greater independence and community acceptance. After school programs for teens offer constructive activities such as theater, leadership programs, volunteer opportunities, job training and homework help. Studies have shown that those who are not left alone after school are much less likely to be involved in self-destructive and delinquent behavior during the teen years. There are times in life when we need the community's support. It may be help finding a job, emergency money, food or shelter, assistance combating addiction, finding low-cost healthcare or resettling in a new country. The Federation is here for you through our funding of the Jewish Family Service of St. Paul. Contact JFS for help and with any questions you may have.